Continuing to Create...: A BIG Birthday Celebration! This is my Mom, Dorothy Moore. She recently celebrated a very BIG birthday and still doesn't look or act her age. She can run circles around me with her endless supply of energy. Isn't she beautiful? I hope to age as gracefully as she has done. Mom has 4 children, 8 grandchildren and 1 great-grandchild. Her passion is sewing, especially quilting and embroidery. Each of her children and grandchildren have a personalized quilt from Nana. Some family members have more than one quilt, especially if they have moved into a new home or graduated from college dorms into personal apartments. My mom taught me to sew when I was much younger. I took a quilting class with her a few years ago but realized my passion is paper crafts. Mom did learn how to stamp but prefers the cards that I make for her. Her most recent accomplishment is her blog. Happy Birthday Mom! This card was made using all SU! supplies and the set, Embrace Life. 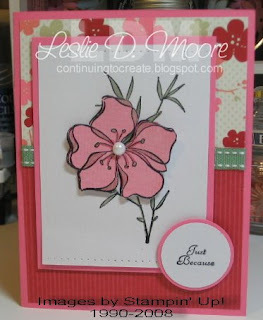 I stamped the main image several times onto Pretty in Pink card stock, then cut out various parts of the flower. Layering the different parts of the flower and adhering with pop-dots adds dimension to the image. Patterned paper, coordinating ribbon, paper piercing, a simple faux pearl and sentiment completes the card. pretty card!! I tried to visit your mom's blog but couldn't get through? Happy Birthday to your mom, what a pretty lady! I hope she had a fantastic day!